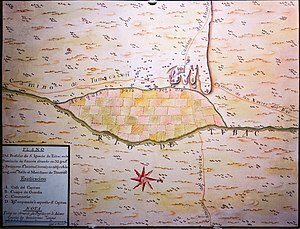 A Spanish colonial map of Tubac from 1767, the site of the San Ignacio de Tubac Presidio, constructed as a result of conflicts with the Pima and other natives. The Pima Revolt, or the O'odham Uprising and the Pima Outbreak, was a revolt of Pima native Americans in 1751 against colonial forces in Spanish Arizona and one of the major northern frontier conflicts in early New Spain. Small scale conflict soon began again, however, and Oacpicagigua eventually died in a Spanish prison in 1755. The colonial government founded three new presidios in Sonora to control the Pima and Seri populace in the years after the revolt: San Ignacio de Tubac, Santa Gertrudis de Altar, and San Carlos de Buenavista, present-day Tubac, Arizona, Altar, Sonora, and Buenavista, Sonora, respectively. While intermittent rebellions continued, by the end of the eighteenth century, Sonoran natives had been largely missionized or Hispanicized, and the assimilated tribes of frontier New Spain were absorbed into the Spanish Empire. ^ Ewing, Russell C. (October 1938). "The Pima Outbreak in November, 1751". New Mexico Historical Review. XIII (4): 337–46. ^ a b c Roberto Mario Salmón (July 1988). "A Marginal Man: Luis of Saric and the Pima Revolt of 1751". The Americas. The Americas, Vol. 45, No. 1. 45 (1): 61–77. doi: 10.2307/1007327. JSTOR 1007327. ^ John Francis Bannon (July 1979). "The Mission as a Frontier Institution: Sixty Years of Interest and Research". The Western Historical Quarterly. The Western Historical Quarterly, Vol. 10, No. 3. 10 (3): 303–322. doi: 10.2307/967373. JSTOR 967373. Henry F. Dobyns (1999). Tubac Through Four Centuries: An Historical Resume and Analysis (full text). Arizona State Parks Board. pp. "CHAPTER V: THE PIMA REVOLT OF 1751".